To help children become familiar with gospel art, I sometimes use pictures from the distribution center and turn them into puzzles. After cutting this picture into pieces, for example, I printed and glued a sentence to the back of each piece that reminded the children of something they could do to follow the Savior. The puzzle is now laminated and ready to go! Editor’s Note: You can find the online distribution center at store.lds.org. I recently visited a Primary where I met a wonderful sister and her son, who had severe disabilities. I was touched by the love that so obviously existed between them. This dear mother demonstrated patience and tenderness. Her son trusted her and felt safe with her near. Like most children in Primary, a child with a disability may be nervous when parents aren’t near. We have many children with disabilities in our Primaries. Are they welcomed with love and caring? Do we strive to understand how we can better meet their individual needs? Do we endeavor to support and assist the families of these children by asking how we can help? Truly, those with disabilities have much to teach us about Christ’s love—not simply in allowing us to develop charity and love for them, but also coming to know them as we open ourselves to their love and acceptance. Editor’s note: For additional resources on this topic, visit disabilities.lds.org. Have you seen the Family Fun Time page in the Friend? This page goes along with the first story in the magazine each month. It has activity and discussion ideas you can use with your family, as well as a simple recipe to make together. It’s a great resource for family home evening. This month’s magazine focuses on media safety. The story on pages 4–5 describes a family home evening where the family talks about important media rules. The Family Fun Time page includes a media checklist and cyberbullying tips you could use to guide a discussion. You could copy or cut out the “Stay Safe Online!” image and hang it on the fridge or by the computer. And don’t forget to make the banana ice cream! How does your family use the Family Fun Time page? Please send your ideas and success stories to friend@ldschurch.org. We’d love to hear from you! General conference means so much to our family. This year we made a banner using chalkboard paper to take notes during conference. We wrote the most notable phrase from each speaker on a pendant of our banner. 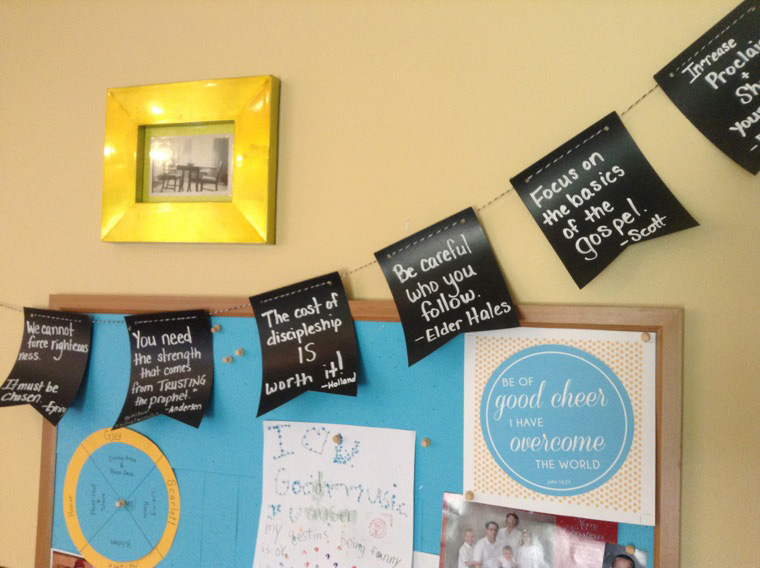 As soon as conference was over, we already had the words of the prophets displayed in our home as a reminder for our family to look to in the coming months. When the next general conference comes, we can erase the banner and start again. Families can easily make a similar banner of their own using card stock, string, and a hole punch. Editor’s note: How does your family keep conference throughout the year? Please email your ideas to us at friend@ldschurch.org! Very young children and those with disabilities often struggle to talk or understand speech. A new page on LDS.org features line art that can be used as a tool to bridge this gap. Here are a few ways you can use these drawings. Communicate expectations, such as preparing for a prayer. Attach concrete ideas to gospel words. Create a visual schedule to reassure children who have anxiety. Instruct as well as allow children to demonstrate what they recall from a lesson. Teach family home evening lessons or prepare a talk for Primary. Children can also use the drawings to communicate wants, such as volunteering to give a prayer or requesting a drink. As families, leaders, and teachers begin to use these new drawings, they will be inspired with ideas to use these tools to bless the lives of the children they serve.